Classic There are 8 products. The Black Cafe series has been designed with Cafe Racer fans and with history in mind. 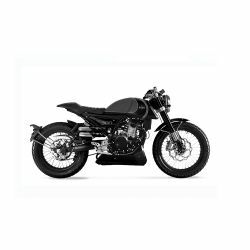 By focusing on the heritage of Cafe Racer culture we have produced a beautiful, yet practical motorcycle that excites and satisfies in equal measure. The Scrambler - Take the heart and soul of the Black Cafe, swap out the standard road tyres, clip on bars & sporty style for rugged trial tyres, wide, high handlebars, and the look & feel of a go-anywhere attitude. Then you have a Scrambler. A bike that can take trail or tarmac easily in its stride. All the mod cons with lots of can do. The RAW is as it's name suggests. Our entry level bike shares many characteristics with the Black Cafe, but keeps the cost down, without having to sacrifice quality or reliability. It's style, whilst reminiscent of it's big brother, relies on minimalism to provide it's "RAW" appeal. Capable, reliable & economical, it's a logical place to start. The Sport Classic 125 "Pagani"
The FB Mondial Flat Track 125 is a sensational piece of design and ONLY available in 125cc. Standing out from the crowd has never been easier and with low rate monthly payments it doesnt break the bank.